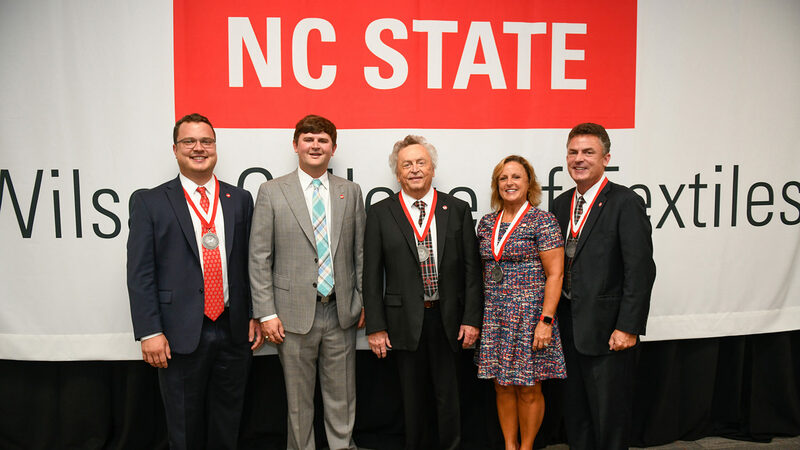 North Carolina State University announced today that it has received a $28 million gift from alumnus Frederick “Fred” Eugene Wilson Jr. and the Wilson family. The gift funds an endowment to support and name NC State’s College of Textiles. Effective immediately the college will be known as the Wilson College of Textiles. The gift is part of the Think and Do the Extraordinary Campaign – a $1.6 billion fundraising effort. It is the largest gift ever made to the college in its 119-year history and makes Wilson College of Textiles only the second named school at NC State. The gift to the Wilson College of Textiles will have a significant and long-term impact by connecting students with new opportunities; allowing for investment in award-winning faculty and life-saving research, and enhancing campus facilities used by students, faculty and industry partners. “This is a historic day for NC State and a truly transformational gift for the College of Textiles. We are tremendously grateful to Fred Wilson and the Wilson family,” said NC State Chancellor Randy Woodson. “Their amazing generosity means that the Wilson College of Textiles will continue to be a vital, vibrant leader in education, discovery and practical application of innovation for years to come. Fred Wilson graduated from the College of Textiles in 1961 with a degree in textile chemistry. He is chairman of the board of directors of Piedmont Chemical Industries Inc., a family-owned and operated chemical manufacturer headquartered in High Point, N.C. The business was founded by his father in 1938 to support the local textile industry and, in addition to other products, manufactures a wide array of textile chemicals to address the wet processing of fiber, yarn and fabric. The Wilson family has a history of philanthropic support and community involvement and strong ties to the College of Textiles. Wilson’s son, Frederick “Rick” Eugene Wilson III ’87, and his daughter, Elizabeth “Cres” Wilson Calabrese ’89, both graduated with degrees in textile chemistry. Fred Wilson’s grandson, Frederick “Rede” Wilson IV ’16, earned his degree in polymer and color chemistry. For Fred Wilson, this gift demonstrates his commitment to a college that, much like the textiles industry, has persevered and evolved despite the economic downturns of the late 20th century. As manufacturing jobs were shipped overseas in search of cheaper labor and mills shut their doors, long-standing textile, chemical and retail industry relationships served the college well and allowed NC State to invest in textiles as other universities shuttered their programs. With insight from key industry partners, in part via the North Carolina Textile Foundation, the college targeted the kinds of education and research that would define the now resurgent field of textiles. Leadership recruited and retained world-class faculty with expertise in chemistry, design, engineering, management and technology – particularly faculty with expertise in emerging areas such as environmentally responsible textile and fiber chemistry, digital printing and composites. Today, the Wilson College of Textiles is unique, diverse and interdisciplinary. It is also the only remaining textiles college in the United States. “When we were talking to the Chancellor about the college and about it being the only college of textiles remaining in the U.S., a lightbulb really went off. Somebody’s got to draw a line in the sand. We’ve got to remember what got us here and recognize where we can go in the future. I’m happy that we could be the ones to do that,” said Fred Wilson. For David Hinks, dean of the Wilson College of Textiles, this gift connects the textile manufacturing tradition within North Carolina with future economic and societal impact by shaping the future of the textiles industry.